Taxonomy is the process of classifying organisms by how closely related they are. Living things are classified into different groups. Think of it like organizing things into folders. At the top are Kingdoms: monera (bacteria), fungi, plantae (plants, moss), animalia (animals) and protista (protists like algae and amoeba). These kingdoms are then further divided into phylum, class, order, family, genus and species. Birds belong to the class Aves. Within this class are orders. Parrots belong to the order Psittaciformes. If you breed finches, canaries or starlings the order you would be interested in is Passeriformes. Within each order are families. The parrot order contains three families which divide it into cockatoos, lories and other parrots. The last two classifications are genus and species. Animals are often referred to by their scientific names, which are made up of the genus and species. The scientific name is always written in italics, with the genus name capitalized and the species name lowercase. Why does any of this make a difference to you? Because birds all have different common names depending on where you are. For example, Eolophus roseicapillus is known as the Galah in its native Australia. Here in the United States it is also called the rosy cockatoo and the rose-breasted cockatoo. Kakarikis also have a mix of common names: kaks, kakarikis, New Zealand parakeets, red-fronted, red-crowned, etc. The scientific name is a way to communicate which animal you are talking about. Sometimes it’s the only way. There is no common name for the genus Brotogeris, which includes grey-cheeked, canary-winged and Tui parakeets, or for Poicephalus, which includes Meyer’s, Jardine’s, senegals and cape parrots. Most poison dart frogs don’t even have common names. Therefore you have to use the Latin names. How do we get species? A species is a type of living organism, in this case a bird, that will not readily breed with other slightly different organisms in the wild. Let’s say there is a type of macaw living in Brazil. One population of macaws becomes separated from the main population by a mountain chain. This smaller group interbreeds and adapts to its location. Eventually the new population will not recognize the original population as being the same. They will not willingly breed with the old population even if their ranges suddenly cross again. Another way species can form is when certain birds within a species pick mates with similar characteristics. Humans do this. People tend to pick partners that are physically similar to themselves. Some psychologists attribute this to the fact that many people are afraid to approach those with stunning physical characteristics (out of fear of being shot down). Howard Voren, one of aviculture’s more prominent experts, found that when he kept golden-capped conures (Aratinga auricapilla) in a flock, the most brilliantly-colored birds paired off with each other. Generation after generation the birds continued to pair off in this manner- plain birds choosing plain mates, birds with a bit more gold pairing with other birds that had a bit more gold. Eventually he had golden-capped conures with gold so extensive that they could pass for jendays or suns! Jendays and suns are both very closely related to golden-caps. He theorized that this is how jendays and suns may have evolved, just from the birds naturally picking mates of similar plumage. Eventually the birds became so different that they no longer recognized plainer birds as being the same species. Here is the full article. The Yellow-collared Lovebird carries one strip of nesting material at a time in its bill, but the related Rosy-faced Lovebird tucks the ends of several strips beneath its rump feathers and flies to the nest with the strips in tow. Hybrids between these two species try to tuck strips into their rump feathers but cannot do so correctly. Sometimes the hybrids fail to complete the tuck; more often they hold the stip by the middle instead of the end, fail to let go of the strip after tucking it, or tuck it into the wrong place; many strips do not reach the nest box. The hybrid’s genetic program for carrying nesting material apparently contains conflicting instructions. Genes carry a vast amount of information about what an organism looks like and how it will act. Genetically speaking, humans and chimps are only a tiny fraction different from each other, yet look at the huge difference that tiny fraction makes! Hybrids, even closely-related ones, mix up the differences between species at the genetic level. The lovebird example above shows how behavior can be affected. 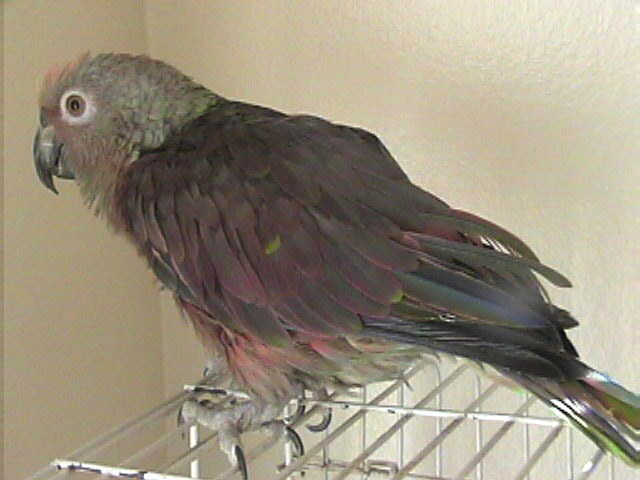 Health too can be an issue, as illustrated by my green-cheek conure hybrid. There is an even greater problem aviculture faces though- the loss of genetically pure stock. In the early 1990's the Wild Bird Conservation Act was passed. This restricted the export and import of virtually all birds. Backed by animal rights groups, this act was promoted to halt collecting and poaching of wild populations, some of which were dwindling due to over collecting. It was a well-meaning act that unfortunately did more bad than good. Many wild birds came from unindustrialized countries where export of native species was THE economy. Cutting off the demand forced them to look at other ways to get income- usually cattle ranching, in which rainforests were destroyed to provide room for the livestock. So the birds couldn’t be exported into captivity and instead faced extinction from deforestation. But I digress. The WBCA has greatly affected aviculture. No new birds can be imported to replace stock. Brotogeris, known as "pocket parakeets," used to be imported in huge numbers. Few breeders bothered with this genus because they were difficult to breed and too inexpensive to bother with. Now you can’t even find them, their captive numbers are so low. Why not just get captive birds from other countries? The WBCA also restricts that. Breeders of captive bred stock have huge difficulties trading birds with other countries and few consider it worth the headache. With no new bloodlines being introduced, the risk of hybridization and inbreeding among the rarer species is great. Many of the greater/lesser/citron cockatoos have been hybridized and unscrupulous breeders may even sell them as pure stock. Once a bloodline has been tainted with hybrid genes, purity can never be restored. Hybrids are not like mutations- they cannot be bred out. Ethically, hybridization is a touchy issue. A few breeders actually promote it, most of us condemn it. Whatever your stance may be, you should NOT purposely breed hybrids and intentionally try to pass them off as pure birds. If it happens accidently or unwillingly like in this case, any offspring should be sold as pets and banded with bands marked "hybrid." You should make any buyers fully aware that the offspring are hybrids and that because of this they should not be bred as they may carry potential defects. If you have one of the rarer species you should not be hybridizing at all. Instead, do everything you can to find the bird a pure mate, either by trading or collaborating with another breeder and participating in a loan. Many people confuse these two terms. A breed is a man made variation within a species. Domestic dogs have thousands of breeds, from the doberman to husky to terrier, but all of these are the same species. Breeds arise during domestication, the process by which man breeds an animal for specific characteristics until it becomes a seperate species from the original wild population. Parrots aren't really domesticated, though some, like budgies, are getting there. You can already see two breeds developing within the budgie species: English (show) and American (pet). Breeds are made through selective breeding, the same way you would select birds to isolate a color mutation. The amazon image was sent in by a reader named Christopher. This was a pet named Petey that he was trying to find a home for. All articles and images contained on this site are © 2001 by Feisty Feathers unless otherwise noted and may not be reprinted or used in any way without the author's permission.